Trailer fairings, frequently referred to as trailer skirts, are the most popular devices for addressing aerodynamic drag on trailers. They prevent wind from ducking in under the trailer and running into the trailer bogie. Fleets and drivers see fewer challenges in operational environments with skirts, as they do not interfere with moving freight in and out of dry van trailers. Skirts are most effective when they extend from the landing gear to the front face of the front trailer axle and are as low to the ground as possible. Depending on the terrain covered by a particular duty cycle, the skirt may need to be shorter. The majority of skirts on the market today are flat sheet materials—composite, metallic, or both—bracketed to the underside of the floor structure of the trailer. Formed or molded panels are also available. Various manufacturers include a rubber flexible strip at the bottom of the skirts to help close the gap between the ground and the bottom edge of the skirt. Skirt reliability, durability, and cost have improved over the last five to seven years. Each area of the trailer represents an opportunity to reduce aerodynamic drag. Both industry and government aerodynamicists have shown that the maximum aerodynamic improvement comes from a combination of sealing the tractor/trailer gap, sealing the trailer underbody, and adding a boat tail. As each device is added, the performance of other devices will be impacted. The airflow over each device changes the operating conditions for the other devices. The performance of a combination of devices will not simply be the additive total of each device operating alone. However the greatest aerodynamic drag reduction comes from using devices in three main areas: gap, underbody, and rear. Addressing the aerodynamics of all three points of drag should give the greatest fuel savings for the vast majority of fleets. 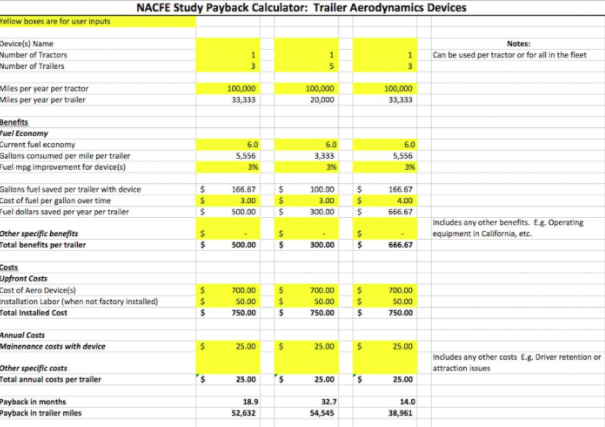 The overall perception of the savings offered by trailer aerodynamics is positive. “They are really effective devices now,” one fleet owner said. Fleets stated that aerodynamic device construction, design, and materials have all vastly improved in the past five to seven years. They have become lighter and more robust. Some fleets feel that drivers have become more accustomed to having aerodynamic devices on trailers and when combined with fuel economy incentive programs, actually appreciate having them. Fleets have been investing in trailer skirts as their first choice for aerodynamic improvements. However, now having done that they are looking at the next steps and are debating the merits of tails versus other options. The study team developed several tools to help fleets make their decision about trailer aerodynamic devices. • There is significant data showing fuel savings for the various trailer aerodynamic devices. 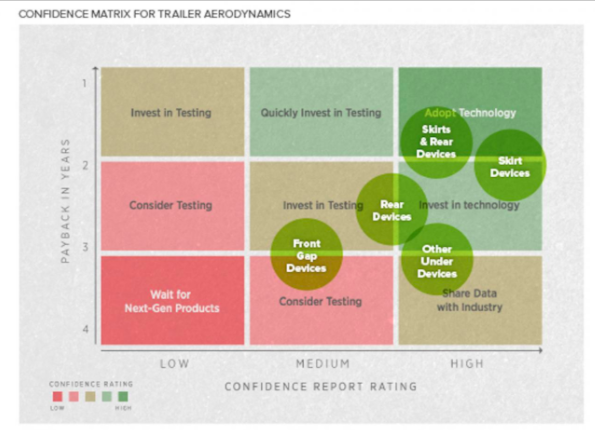 The priority for device adoption by fleets is skirts, tails, front, and then other devices. • Devices have matured and will continue to improve. Skirts have become lighter, less expensive, and more robust improving their payback. Other devices are maturing but need continued development to improve their total cost of ownership. • There are unique challenges with trailer aerodynamics. These include the trailer to tractor ratio, the fact that the purchaser of the aerodynamic device is not the one buying fuel, and the fact that some devices need driver intervention. • Performance for each fleet is difficult to determine. • Regulations will drive great adoption. This list represents some manufacturers of trailer fairings but it has not been vetted to ensure product availability.